Imagine leafy tree-lined avenues, flourishing vineyards and elegant private residences – welcome to the exclusive Cape Town area of Constantia. Villas, self catering accommodation and holiday rentals of Constantia generally offer private pools & beautiful gardens, lovely mountain views, stylish colonial architecture, and secure accommodation. If a serene and relaxed family holiday in Cape Town is what you seek, then choose from one our luxury rental villas or self catering holiday homes and guarantee yourself a memorable vacation in Cape Town. Constantia proudly offers a delightful history steeped in the development and international exposure of some of Cape Town s finest wines. The Constantia Valley is the birthplace of South Africa’s wine farming industry and boasts five fabulous wine estates actively cultivating internationally acclaimed and award winning wines. Bordered by magnificent Cape Town mountains, Constantia is blessed with excellent soils, moderate temperatures, good rainfall and cool sea breezes, making this area ideal for growing. Choose a luxury holiday rental villa in Constantia and you surround yourself with the finest wines in South Africa and indeed, the world. If you’ve chosen self catering accommodation in Constantia, it is a must to visit all five Constantia farms in order to truly appreciate the delectable wines the area offers. The wine estates of Groot Constantia, Klein Constantia, Constantia Uitsig, Steenberg and Buitenverwachting offer a lovely variety of wine shops, museums, wine tasting and some of South Africa’s most superior restaurants – namely Constantia Uitsig, La Colombe, Buitenverwachting and Steenberg. From fine wines to the gourmet dining, a holiday in Constantia offers endless indulgence, relaxation and breathtaking beauty. Other highlights of this wonderful Cape Town are include the world-class Steenberg Golf Estate which offers private self catering holiday accommodation and luxury Constantia rental villas on the most beautiful Golf Estate in the Cape. And don’t forget the Constantia craft market, local horse-riding and mountain-biking trails, and the upmarket Constantia Village Shopping Centre which offers a wonderful variety of boutiques, coffee shops and restaurants. Short drives you’re your Constantia accommodation will take you to either the False Bay coastline with its charming historical suburbs and warm waters, or to the beaches of Hout Bay and Llandudno. Also within short distance of Constantia is the world-famous Kirstenbosch National Botanical Gardens where one can spend hours wandering through the splendour of countless different botanical displays, such as the Fragrance Garden, the Dell, the Cycad Amphitheatre, Matthew's Rockery and the Fynbos Walk. Alternatively summer picnics on the rolling green lawns gazing at the breathtaking mountain backdrop listening to the music of one of Kirstenbosch s many sunset concerts is a fine way to spend your holiday in Cape Town. A stylish four bedroom holiday home in Constantia with a private decked swimming pool, garden and indoor-outdoor entertainment area. .. Stylish family home situated in Constantia and close to magnificent hikes and mountain bike routes in Tokai Forest and Silvermine reserve. ..
A stylish three bedroom villa set in the sought after Stonehurst Estate on the slopes of the Silvermine mountains, overlooking the Constantia Valley and beyond. ..
A spacious double storey family home with a solar heated swimming pool, a wonderful under cover entertainment area and beautiful mountain views. .. Stylish home with great flow between indoor and outdoor areas with attention to detail throughout. ..
Charming family home with swimming pool, garden and expansive views, located in the upmarket Stonehurst Mountain security estate. ..
Sheard House is situated in the leafy suburb of Rondebosch. This 5 bedroom en-suite home is the perfect place to holiday with family and friends, allowing you the freedom to socialise in the spacious entertainment areas, or to spend some "me time" in your.. This home is situated in one of the Cape’s oldest wineland areas, surrounded by renowned wine estates and award-winning restaurants. ..
A well-presented modern home in a small security estate surrounded by some of the Cape’s oldest wine farms. ..
A charming double storey 5 bedroom family home is set in the Southern Suburbs with a French Provencal style - ideal for a large family to relax. .. Outstanding! This modern private home offers luxury and comfort in a beautiful setting. Located in the leafy up-market suburb of Constantia with it’s wonderful offerings of wine farms, world renowned restaurants and access to many beautiful walks. 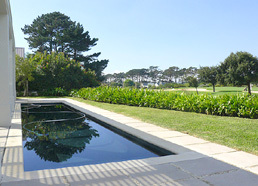 ..
Splendid private villa set in an upmarket security estate in Constantia. Strawberry Lane is a spacious and modern family home offering a quiet and relaxed retreat in stylish comfort. ..
Set in the heart of the Constantia Valley, within walking distance of Constantia Uitsig and surrounded by the mountains of the Peninsula, lies Constantia Villa, an immaculate, north facing, sun filled 3 bedroom home plus separate cottage and pool set in ..